30.06.2018: CPC from JTO(E) to SDE(E) is also in the process of approval for SCF quota for 86 nos. posts. The list shall be released shortly. 30.06.2018: AIBSNLEA Vision and Positive approach benefited thousands of Executives by promotion through CPCs: AIBSNLEA since beginning was trying to get filled up all the vacant Group-'B' and Group-'A' (STS) equivalent posts and simultaneously persuaded for the implementation of CPSU Cadre Hierarchy since Feb-2011. AIBSNLEA was demanding CPSU Cadre Hierarchy implementation in the form of "Non Post Based time bound functional promotions upto the level of SG-JAG level and post based promotions after SAG level and above. Accordingly a Joint Committee headed by the then PGM(FP) Sh. S.R. Kapoor was constituted wherein AIBSNLEA, SNEA & AIGETOA were the participants but the Committee could not reach the unanimity and Mr. S.R. Kapoor retired. Then Sh. N.K. Narang, the then PGM(SR) headed the Committee but this Committee also failed to submitted the report. Thereafter, our CMD BSNL Sh. Anupam Shrivastava ji intervene in the matter and a new Committee headed by the then ED(NB) Sh. M.A. Khan was constituted having the GM(Estt. ), GM(EF), Jt. GM(Pers.) official side members and Association side AIBSNLEA, SNEA and AIGETOA as the members. This Committee after number of marathon meetings submitted the report in Sept-2016 but the report was not liked by the then PGM(Pers.) and he kept it pending. Again we took up the matter with CMD/Director(HR) BSNL and after their intervention PGM(Pers.) redrafted the CPSU Cadre Hierarchy in discussion with so called majority Associations and gave presentation to CMD/Director(HR) BSNL wherein he limited the functional promotions upto Sr. SDE level only, the bench marks were made stringent and Jt. DGM designation to E-5 grade to AGMs was not considered. AIBSNLEA immediately protested against such dilution of Khan Committee report and demanded immediately to take the views of AIBSNLEA also as 2nd majority Association. Management Committee of BSNL Board immediately directed PGM(Pers.) to take the views of AIBSNLEA also after discussions PGM(Pers.) hold discussions with AIBSNLEA and incorporated some suggestions viz. functional promotion upto AGM Level, Jt. DGM designation in E-5 scale and numerical benchmarks for promotion to avoid heavy droppings etc. The cutoff date from last CPC or year of recruitment, eligibility SDE/AO to DE/CAO was not considered 7 years instead of 12 years and the cutoff date was decided 01.01.2017. This revised CPSU Cadre Hierarchy proposal was considered by the Management Committee of BSNL Board but the BSNL Board approached the CPSU Cadre Hierarchy on prospective dated which created problem that seniors was not getting any benefit of CPSU Cadre Hierarchy rather were being put in loss. In view of this, AIBSNLEA impressed upon the management for the filling up of all the vacant Group-'B' and Group-A' (STS) level posts immediately before the implementation of CPSU Cadre Hierarchy. AIBSNLEA concern was appreciated by the management and they started the process of CPCs immediately. In the first phase management Committee allowed Pers. Cell to conduct the CPCs in accordance with the promotions being made by other ministries. Meanwhile Hon'ble Supreme Court delivered the judgment on SC/ST roster implementation in promotions and accordingly BSNL Management immediately issued 1987JTO to SDE(T) LDCE quota promotions and 3000 JTO to SDE(T) SCF quota promotions. AIBSNLEA continued its efforts to get conducted CPCs in all disciplines which resulted 2227 JAO to AO promotions, 3450 SDE(T) to DE Promotions, JTO(TF) to SDE(TF) and SDE(TF to AGM(TF) promotions, SDE(E) to EE(E) and JTO(C) to SDE(C) promotions. Now efforts are being made to get CPCs conducted from AO to CAO, JTO(T) to SDE(T) to fill up all the vacant posts. The promotion orders from JTO(E) to SDE(E) and SDE(C) to EE(C) are expected shortly. All the above promotion orders have been issued and are being issued with the untiring and dedicated efforts of AIBSNLEA. Some vested interests tried to block the CPCs but failed. AIBSNLEA always demanded CPSU Cadre hierarchy on the basis of Khan Committee report to benefit the executives in true sense/sprit. AIBSNLEA congratulated all the executives got promoted and now getting promoted. History has been created in BSNL. AIBSNLEA is extremely thankful to CMD, BSNL, Direrctor(HR), Director(CM), Director(CFA/EB), CGM(Legal), GM(Pers. ), GM(Estt. ), Jt. GM(Pers. ), GM(SR) and the concerned officers of Pers. Cell, who involved in the process of CPCs and completed successfully by their Hard Work within the assigned dead line. Comrades, attached list is a list of un-accessed cases. All the Circle Secretaries are requested to forward screening committee report in single excel file itself (list 5, 6,7, 8 in separate sheets, if possible of all pending cased urgently by tomorrow to AGM (DPC), BSNL Corporate Office positively. 30.06.2018: A Report on the Meeting of Central Office Bearers, Advisors, Consultants and Circle Secretaries held on 28.6.2018 and 29.6.2018. A meeting of the Central Office Bearers, Advisors, Consultants, and Circle Secretaries was held at Hotel Grand Southern, Karol Bag, New Delhi. Com. Shivakumar, President welcomed one and all. He mentioned in his address that the meeting is called in a crucial juncture and will have to discuss many important issues in the meeting and requested all to actively participate in the deliberations. After self-introduction, Agenda items were presented and the agenda items were passed unanimously. Com. Prahlad Rai, General Secretary has submitted the report on the activities. He has briefed about the difficulties faced after the membership verification due to the anti-activities of the majority association in support with few of the officers in the corporate office. He also mentioned about the support he received from the top level management and how AIBSNLEA over came from such situation. GS also expressed about the activities of CPSU CH, activities of the anti-executive Majority Association on the CPSU CH, intervention of the AIBSNLEA on the CPSU CH and its present status. He appreciated the support of CMD, BSNL and Director (HR) during the time of crisis after the membership verification, subsequent realization of the management that recognizing only one association as Majority Association will not be in the larger interest of the executives and BSNL at a large. GS also brief about the status of the Court Case at Allahabad High Court regarding the Recognition Rules. GS requested all the Circle Secretaries to brief about the activities taken by respective circles to increase the membership after membership verification. GS further informed that AIBSNLEA is lacking in marketing. All the achievements of the AIBSNLEA are marketed by Majority Association, as their own achievement. He requested all to counter the false claim of the Majority Association and propagate the efforts and achievement of the AIBSNLEA which will help in increasing its membership. Circle-wise membership position was discussed in detail along with the action plan to increase the membership. Circle Secretaries present in the meeting has submitted the report on the performance of the circles. Organising Secretaries has presented the report of the Circles under their jurisdiction. All the AGSs, Advisors and Consultants also submitted their reports. GS while summing up has mentioned that details of the membership are now available with the CHQ. Wherever there are no branches, Circles will have to take action to form branches at all SSAs. He also mentioned that next referendum will have to be faced by AIBSNLEA alone. All the Circle those not conducted the Circle conference should the Circle Conference before the ensuing CWC at Dehradun. He requested OS (North) to extend full support to UP (E) and support the ACS who is holding the charge of CS. The organizational situation of Gujarat Circle was discussed in details. The body has authorized Com. B S Reddy and Com. Rajpal to visit Gujarat Circle and settle the issue within 15 days. GS further informed that before the CWC at Dehradun, all the Circle Secretaries will have to update the circle websites. CHQ Website should be regularly updated by Com. Bhagwan Singh. GS informed that the he will ensure that the CPSU CH is made applicable to PA PS Cadre and change of cadre controlling authority from Director (HR) to CGM will also be taken up along with pending cases of holding of CPCs of PA to PS promotion case of stenos drawing the pay scale of Executives under ACP scheme. He has mentioned that many of the consultants are regularly contacting the GS and guide the CHQ from time to time. GS condemned the criticizing of consultants in whatsapp and requested to not repeat such activities by the leaders. It was decided that the Admin of the whatsapp group should issue instructions that it is only for exchanging the information and not to be used for criticism. The meeting congratulated the Raj Bhasha Adhikari for their promotion orders from E1-E2 pay scale, due to the efforts of AIBSNLEA. Welfare Scheme: Details of the scheme will have to be displayed in the CHQ website. Separate account will have to be opened for the welfare scheme. CPSU CADRE HIERARCHY: After lot of discussions and deliberations, it was decided that Association will continue its efforts for the filling up teh vacant Group-'B' and Group-'A' STS level equivalent posts before implementation of CPSU Cadre hierarchy. AIBSNLEA will ensure true implementation of CPSU Cadre Hierarchy after its notification. GS briefed about the status of 3 PRC, efforts taken, reply received from DoT and about the various meetings in various departments of DPE, DoT, BSNL, MoC, etc. He informed the present status and mentioned that the reply for the DoT query is being made by GM SR and the details of the discussions taken in the All India Unions and Associations. He has also mentioned about the details of the anti AIBSNLEA activities taken by the GS SNEA and the letter written by GS SNEA against the continuance of the GS AIBSNLEA in office after the retirement. President and GS mentioned about the displeasure of AIBSNLEA on the anti-AIBSNLEA activities of GS SNEA and the reaction of the GS BSNLEU on the action of GS SNEA. He also briefed about the assurance of GS BSNLEU in settling the issue with GS SNEA. After lot of discussions and deliberations, it was decided to continue and lead the All Unions and Associations forum for the implementation of the 3 PRC for the largest interest of the executives and non-executives of BSNL keeping away difference of opinion with the GS SNEA. GS briefed in detail about the actions taken by the Association in order to pursue the management to hold CPCs before implementation of the CPSU CH, in order to extend maximum benefit to the executives. He also explained about the activities of the GS SNEA which are making hurdles in holding the CPCs on the plea of immediate implementation of CPSU CH. He mentioned about the activities and efforts taken including the withdrawal of court cases to succeed the holding of CPCs. He has mentioned the status of the CPCs of all the disciplines and grades. The AD OL cadre has been restructured and E2 scale has been granted w.e.f. 1.10.2000 notionally. House has appreciated the efforts of the GS, as the case of AD OL was only pursued by AIBSNLEA and no other association done anything for the cadre. After the allotment of accommodation for the AIBSNLEA in the IR area, the complete area was renovated and the entire staff and officers are appreciating the association. The issue of co-ordination and forming united forum with the AIGETOA was discussed in detail. It was decided to keep the relation with all. It was unanimously passed that Com. Prahlad Rai, General Secretary be continued as G.S. AIBSNLEA till the next AIC is held. AIBSNLEA on 29.06.2018 during lunch hours arranged a farewell party to Shri R.K. Mittal, Director (CM), BSNL Board, who is retiring on superannuation on 30.06.2018. Smt. Sujata Ray, Director (HR); Shri H C Pant, CGM (Legal); Shri Keshav Rao, GM (Pers); Shri Sourabh Tyagi, GM (Estt); Shri A M Gupta, GM (SR); Smt. Smita Choudhari, GM (FP); Shri Manish Kumar, Jt. GM (Pers); Shri V K Sinha, OSD to Director (HR) and Shri Surendra Kumar CLO have attended the party. Com B S Reddy, AGS (Engg), CHQ convened the meeting and all the dignitaries were felicitated. Com. Shivkumar in his welcome address thanked all the dignitaries and guest for their support and help for completing the CPCs and issuing order in a record short time and wished happy retired life to Shri R.K. Mittal. Com. Prahlad Rai in his address mentioned that Shri R.K. Mittal being the Director (CM) due to his strategic move BSNL could adjust and survive the market against the free service introduced by the Reliance Jio. He mentioned that Reliance Jio is proposing the IPO and will collect the money from the market and will take 'U' turn and stop offering the free service and BSNL can further compete with the market and BSNL will continue its strength, quality of service which was possible for MNP to a great extent. BSNL in the CM segment has maintained a very good service which was possible due to the vision and action of Shri Mittal in a silent manner. Higher revenue was earning by the BSNL from the CM segment. The loss of BSNL could reduce only because of the CM segment. BSNL is working with dedicated and hard working team. BSNL is given popularity in the telecom sector of the country. Motivation factors have been developed in the minds of the employees. It is proved beyond doubt that BSNL can turn around due to dedicated hardworking of Director (F). In the enterprises business also lot of revenue has been earned. CFA segment was facing lot of problems due to non availability of tenders and after joining of Shri N K Gupta, the then Director (CFA) has improved the situation. It was difficult for the field officers to work without materials and now the situation has been changed by procuring the material required and providing adequate support to the field requirement. The team work of Board of Directors under the leadership of CMD, BSNL only instrumental for the BSNL to turn around to the present situation. GS thanked Shri Mittal for accepting the invitation and wished him a happy and prosperous retired life. He mentioned that while working in office, every day there is challenge and many issues are creating de-motivation and frustration and the retirement with all the benefit is the greatest achievement of life. He is retiring with honour and congratulated him. He thanked Keshav Rao, GM (Pers) for working day & night to complete the CPCs and issuing promotion orders for all segment of executives. He also mentioned that without the help of CGM (Legal), it would not have been possible to complete the CPCs in a record time. He also mentioned that CGM (Legal) was very kind enough with positive in pursuing with the case. He also thanked Shri Surendra Kumar CLO and Shri V K Sinha, OSD to Director (HR) for their support and guidance. He also thanked Sourabh Tyagi GM (Estt) for giving impartial guidance and support. He also thanked Shri Gupta GM (SR) for giving positive advice and being a very good supporter and keeping liaison between the management and the associations. He mentioned that AIBSNLEA is making efforts from 2011 onwards for the CPSU CH and since the same could not be implemented from with retrospective effect, we were eager to complete the CPCs before the implementation of the CPSU CH and thanked the entire team for holding the CPCs and requested Director (HR) to complete whatever possible CPCs before issue of CPSU CH. He also requested to issue the Civil Electrical Executive Engineer promotion which is pending in the personal section and give great relief to the cadre. He thanked Director (HR) for approving the pay scale of Rajbasha Adhikari. Many things, which were never expected by any of the associations under the leadership of Director (HR) could achieve, which was possible due to the team work and positive and support of great leader like Smt. Sujata Ray Madam. Com. Prahlad Rai has appreciated and thanked the Director (HR) for creating the software and platform for the BSNL retirees and requested to settle the medical re-imbursement which is pending since April. He thanked everyone for the patient hearing. Smt. Sujata Ray, Director (HR) thanked the AIBSNLEA team for arranging such a felicitation for Shri R K Mittal, Director (CM). She mentioned that the contribution of Shri R.K. Mittal with his sharp and analytical skill was an asset for the BSNL management to have as Director like Shri Mittal in the BSNL Board. She mentioned that the entire board plays a very vital and cohesive roll under the leadership of Shri Anupam Shrivastava. She informed that CMD BSNL could not attend this fucntion because at present he is seating in PSEB wherein Direcor(CFA) interview is going on and Director(EB) has gone to DoT to attend the meeting in Minister Office. She mentioned that she is very fortunate to have the entire team of Personal section and Shri Mittal as a colleague in the BSNL Board. She mentioned that the approach of Shri Mittal was very open and was co-operative in arriving the decisions. BSNL board has got very much help from the support of Shri Mittal who has lot of skills, knowledge and help to his colleague and CMD. She mentioned that Shri Mittal was very bravely with sheer knowledge and uprightness has brought the GSM market to the former glory which will help to further revive the CM sector. The entire credit goes to Shri Mittal and he is hero of BSNL. She also mentioned that she was really placed good roll as colleagues and she was able to take many decision in the finance sector. She mentioned that she is waiting to hear Shri Mittal so that plan and act in the remaining service. She mentioned that we are emotionally attached with the organization and she is blessed with wonderful board, colleagues, HR team gifted with many skills. She mentioned that she is fortunate and lucky to sort out the court cases and issue maximum promotion orders to promote as many as possible. She also thanked Shri Mittal for his support given for the finalization of the CPSU CH. She mentioned that people are working very hard and will try to sort out as many as issues at the earliest. She mentioned while celebrating the victory, not to pull down those who are fortunate to have success. Wisdom experience and good decision will preserve for the tomorrow's BSNL within a year or so and we should have selective happiness and rejoice together and work together and wished Shri Mittal whose presence has enriched the BSNL Board and wished him a happy fruitful and relaxed retired life. Shri R K Mittal, Director (CM) in his addressed mentioned that he is very much thankful for the felicitation given to him. In his addressed he remembered the days he worked in MTNL while selected him as Director of BSNL. He mentioned that, it was not easy for him to get selected as Board of Director of BSNL and it is Herculean task to become a Board member. He mentioned he is not regretting his decision to join the BSNL board missing his 7th pay commission benefit. He also mentioned that in the struggle to revive BSNL he has selected few para meters like MNP by providing quality service. He has mentioned that BSNL was MNP positive for the last 3 consecutive years with more than 15 lakh in the year 17-18. He mentioned that he was to do many more things to do, but due to time availability constraint, he has limitations. He mentioned that if given a chance, he will be happy to serve BSNL further. He has congratulated the Director (HR) while referring the CPCs in the mass scale, and mentioned that the entire team which is resilience of BSNL that such kind of work can be done in BSNL within a short span of time by working day and night. He has thanked his colleagues in the board, CMD and thanked every one for giving opportunity to serve the BSNL. Com. C.M. Saste, Organising Secretary, CHQ thanked every one for their presence and support. Meeting ended with Nation anthem. AIBSNLEA's consistent efforts yielded result in getting released promotion orders to the grade of EE (Electrical) on Regular basis with immediate effects. AIBSNLEA congratulates all the promote officers. AIBSNLEA is thankful to CMD BSNL, Director (HR), BSNL Board, GM(Pers. ), Jt. GM (Pers. ), OSD to Director(HR) and other officers in Pers. Section New Delhi, all the HR team of various Circles for the same. AIBSNLEA is thankful to CMD BSNL, Director(HR), BSNL Board, GM(Pers. ), OSD to Director(HR) and other officers in Pers. Section New Delhi, all the HR team of various Circles for the same. AIBSNLEA is thankful to CMD BSNL, Director(HR), BSNL Board, GM(Pers. ), GM(FP), OSD to Director(HR) and other officers in Pers./SEA Section New Delhi, all the HR team of various Circles for the same. AIBSNLEA's consistent efforts yielded results in getting approved the proposal for up-gradation of pay scale of AD (OL) / Rajbhasha Adhikari from E1 to E2 to be effective from 01.10.2000 notionally. Actual benefit shall be effective from the date of issue of order in this regard by BSNL Corporate Office. We will pursue its endorsement from BSNL Corporate Office at the earliest. It is learnt the Hon'ble Ernakulam CAT has not granted any stay on the SDE to DE promotions when the case was brought before the CAT and passed the directions that the promotion orders can be issued subject to outcome of final verdict. CHQ President replies SR Cell letter number BSNL/31-2/SR/2018 (Pt.) dated 26.06.2018 regarding AIBSNLEA stand on the CHQ office bearers who retired during this term till next AIC as per the provisions of the constitution of AIBSNLEA. Com. GS discussed with G.M. (Pers) and requested for releasing the promotion order from SDE (T) to DE. GM (Pers) mentioned that CPC work is in progress. The promotion orders may be issued today late evening or tomorrow. Dear Comrades, please have patience. AIBSNLEA is continuously pursuing the matter. Ultimately promotion orders are to be issued by Pers. Cell only not by others who are giving minute to minute basis commentary. GM (Pers) categorically told that my staff working for CPC should not be disturbed by any one by sitting there. It is really saddened to report that SNEA, the so called Majority Association, when the BSNL Management not accepted their demand of immediate notification of CPSU CH, they have taken the CAT Chandigarh route to stall the CPC proceedings for SDE to DE promotions. Today, one of their Office Bearer Shri Ramesh Kumar alias Ramesh Kumar Nehra, District Secretary, SNEA, Rohtak (Haryana) has filed an OA in the CAT Bench Chandigarh and appeared in person and got directions that "The respondents are directed to make promotions from the post of SDE to AGM as per Hon'ble Apex Court judgment cited above, after following the catch up rule in terms of the above said judgment by complying with the mandate of M. Nagraj, subject to final out come of the OA". The so applicant Shri Ramesh Kumar belongs the SDEs seniority List No. 8. GS President met Director (HR) and requested for issuance of the promotion orders by expediting CPCs in all disciplines. Director (HR) mentioned that all cadre controlling authorities are busy with ongoing CPC work of their respective cadres and the efforts are being made to issue promotion orders before 30.06.2018. GS, President and Advisor (South) met GM (FP) and discussed regarding CPCs from JAO to AO, AO to CAO and CAO to DGM. GM (FP) informed that JAO to AO CPC was expedited two days before and minutes were submitted to the competent authority. Meanwhile Hon'ble CAT Ernakulam has given directions not to issue promotion orders till 29.06.2018 after hearing the case. Thus the promotion orders for 2400 JAO to AO can be issued after the outcome of the court case. AO to CAO CPC is under process but promotion order can be issued on vacation of the stay orders by the Hon'ble CAT Chandigarh and filing a Writ Petition in Hon'ble High Court Chandigarh on Catch-up Rule. DGM (Adhoc) to DGM (Regular) in the Finance Wing of 55 executives. CPC to be conducted tomorrow. CAO (regular) to DGM (Adhoc) for 38 executives is under process for getting approval from the Management Committee with one year relaxation. GS, President, AGS (HQ) and Advisor (South) Comrade S Narendra met GM (Pers.) and discussed regarding CPC from SDE (T) to DE (T). GM (Pers.) informed that CPC work is in progress about 3320 SDEs are being promoted to DE (T) posts for whom the APARs have been accessed and VC have been received. The minutes of the CPC are being prepared today which will be submitted to the competent authority immediately for approval. The promotion orders are expected to be issued by tomorrow morning. About 290 SC/ST candidates from the seniority List No. 8 along with the seniority List No. 5, 6 & 7 candidates are being considered. The CPC was initiated to fill-up about 4800 posts but about 434 cases HRMS numbers are not available and 115 are unassessed due to various reasons. Thus the DPC has been conducted for 4711 candidates. CPC from JTO to SDE, SDE to DE and DE to DGM: GM (Pers) mentioned that JTO to SDE (T) CPC is under process but it will take two to three months time. SDE to DE CPC is in progress wherein seniority List No. 6 & 7 are being covered along with 287 SDEs of SC/ST quota from the seniority List No. 8. Total 4700 SDEs are being considered. About 3000 SDEs APARs have been accessed and promotion orders will be issued subject to availability of VCRs. Promotion orders are expected today. Regarding DE to DGM promotion, GM (Pers) mentioned that these promotions will be considered in the month of July or August 2018. Regarding AO to CAO CPC it is learnt that the stay order granted by Hon'ble CAT Chandiagrh has not been vacated so far. In the other court case on Catch-up rule, BSNL is filing an MA with in a day or two and there after on vacation of the stay orders, the promotion orders from AO to CAO may be issued. Regarding other disciplines i.e. TF, Civil, Electrical, Arch Engineering Wings the CPCs have been expedited and the promotion orders will be issued by 30.06.2018. OA against the promotion of JAO to AO came up for hearing today. Case posted for 29.06.2018 for filing reply. Court stated that how a screening committee was formed within a day and how the report was submitted by the committee. However no stay order issued. JAO to AO promotion CPC has been expedited and the minutes have been submitted to the competent authority for approval. Promotion orders will be issued after the out come of the court case. It is really saddened to report that SNEA, the so called Majority Association, publishing sentimental news against AIBSNLEA to masquerade their false face. AIBSNLEA DS of Kottayam Branch has been called by some of his batch mates belonging to SNEA informed about their move to claim their promotion along with CPC covering JAOs up to 2013 and sought his joining also as he is a lone member of AIBSNLEA in that batch. Though this batch of JAOs belongs to JAO batch 2012, they have been trained in 2016. Being informed that all his batch mates are moving together for their claim, he was requested to join. Before signing, DS was reassured that the case is for considering their promotion alone. From SNEA site only he could understand that his signature has been used for the stay purpose also along with other Non-AIBSNLEA Members. By understanding the trap move of another association Com. DS rushed today morning to Ernakulam and withdrawn his signature on today morning itself. BSNL Corporate Office today issued instructions to the field unit citing that since AIBSNLEA has deferred its agitational programme, the instructions issued vide letter of even number dated 26.06.2018 under para 3& 4 may not be acted upon. 26.06.2018: Deferment of Demonstration program on 27.06.2018 during Lunch Hours. In view of the assurances given by the Director (HR) during its meeting with AIBSNLEA, SNEA, AIGETOA and SEWA to conduct maximum CPCs before notification of CPSU Cadre Hierarchy, it has been decided to defer the Lunch Hour Demonstration at all Circle/SSA HQs and BSNL Corporate Office on 27.06.2018. Director (HR) has assured to withdraw / modify the SR Cell letter baring grant of leave to AIBSNLEA Office Bearers for attending the CHQ Office Bearers, Advisors, Consultants and Circle Secretaries meeting at New Delhi on 28th and 29th June 2018. Necessary orders will be issued tomorrow. All the participants coming on 27th June 2018 for attending the CHQ Office Bearers, Advisors, Consultants and Circle Secretaries meeting at New Delhi are requested to directly reach the venue i.e. Hotel Southern Grand (011- 47534790), Arya Samaj Road, Karol Bagh instead of going to Rajendra Nagar BSNL IQs. This arrangement has been decided for the convenience. Venue of the meeting of CHQ Office Bearers, Advisors, Consultants and Circle Secretaries along with their boarding and lodging arrangements have been made in the Hotel Southern Grand (011- 47534790), Arya Samaj Road, Karol Bagh on 28th and 29th June 2018. Those who are reaching on 27th morning and staying on 30th may stay in Rajendra Nagar, BSNL IQ Suit No 16,18,19 & 21. Caretaker No 011- 28743603. The IQ Suits are nearer to Karol Bagh meeting venue. The allotment of rooms will be made at the hotel reception counter on the arrival. The taxi arrangements for departure will be made available by hotel on demand on nominal payment basis. All the CS / DSs are requested to collect and send the representations of recently promoted SDE telecom through SCF quota and LDCE quota for their change of posting as per their request to CHQ for consideration and pursuance. GS and President met CMD BSNL and requested to direct the Pers. Cell for expediting CPCs to fill-up the all vacant existing Group "B" and Group "A" STS level posts before implementation of CPSU Cadre Hierarchy. CMD BSNL mentioned that he has already directed Pers. Cell to conduct the CPCs and now we may pursue with Director (HR) for expediting CPCs. b. SDE (TF to AGM (TF): 12 AGM(TF) post are being filled up by 30.06.2018.
b. SDE(C) to EE(C): 155 posts of EE(C) are to be filled up but there is stay orders from Hon'ble CAT Chandigarh for implementation of Catch-up Rule, wherein BSNL is filling Writ Petitions in Hon'ble High Court within 2-3 days in accordance with the recent Judgement of Hon'ble Supreme Court on SC/ST roster and DOP&T guidelines. After filling the writ petition promotion order will be issued subject to outcome of court case. a. JTO (E) to SDE (E): 126 SDE (E) posts will be filled up by 30th June 2018. VCR have been called for. b. SDE (E) to EE (E): 130 EE (E) posts will be filled up by 30.06.2018.
b. SDE to EE (Arch. ): no vacay is there for SDE to EE(Arch.). b. AO to CAO: 335 regular vacancies, 284 CAO posts got vacated on DGM Adhoc promotion, 336 MT quota posts to be utilized. Therefore, 955 CAO posts are to be filled. GM (FP) told that efforts are being made to fill up these vacant posts after getting clearance from Pers. Cell, filling the writ petition in the Hon'ble high court Chandigarh against the stay order granted on Catch-up Rule and filling MA in the Hon'ble CAT Chandigarh on the basis of recent Supreme Court judgement and DOP&T instructions. GM (FP) assured an early action in this regard. We further requested to promote all the eligible AOs to CAOs by up-gradations. a. JTO (T) to SDE (T): We expressed our serious concerned against non-filling up of the vacant SDE (T) posts by the eligible JTOs . JTO recruited in the year 1999 is still waiting for its first promotion after a gap of 19 years. This is the most frustrating and de-motivating situation wherein other streams up to 2013 recruited executive are getting promotions. To bring parity among the cadres, it is required to promote all the JTOs recruited up to year 2013 and having requisite eligible service. Director HR appreciated our concern and directed GM (Pers) and Jt. GM (Pers) to examine and process the case for CPC immediately. b. SDE (T) to DE (T): Jt GM (Pers) informed that CPC has been processed to fill up 4887 posts (1782 regular and 3105 through up-gradation ). He further mentioned that there is no stalemate in the CPC and efforts are being made to issue before 30th June, 2018. We extended our sincere gratitude and thanks to Director (HR) for her kind concern towards executives. (a) Our request to hold ongoing CPCs before notification of CPSU Cadre Hierarchy. (b) Notice for holding of Demonstration on 27.6.2018 for drawing attention of Management to hold CPCs before notification of CPSU Cadre Hierarchy. BSNL Corporate Office has informed that after compilation of some of the SCRs it has been observed that the date of joining of some of the executives are not in consonance with their promotion orders. Therefore, it is directed to provide date of joining of these executives as per their service book for considering them for promotion to the grade of AGM/DE (T) on regular basis before 25.06.2018. It has also been clarified that the Circles are to provide SCR in respect of all those executives who were working under them as on 31.05.2018. All the Circle Secretaries are requested to kindly arrange to sent the requisite information to BSNL Corporate Office at the earliest. BSNL Corporate Office has issued instruction for constitution of Screening Committee and forward the duly filled up / signed Screening Committee Report in the prescribed proforma - Annexure -A in respect of AAOs / JAOs as per the provisional eligibility list (Annexure - B). The Screening Committee Reports should reach to BSNL Corporate Office latest by 23.06.2018. 22.06.2018: AIBNSLEA Central Office Bearers, Advisors, Consultants and Circle Secretaries meeting at New Delhi on 28th and 29th June 2018. AIBSNLEA decided to hold its Central Office Bearers, Advisors, Consultants and Circle Secretaries meeting at New Delhi on 28th and 29th June 2018 to discuss the status for holding of all the CPCs in all the disciplines to fill-up all vacant Group "B" and Group "A" level posts in various disciplines before notification of CPSU Cadre Hierarchy. The situation has warranted us to hold this emergent meeting of Central Office Bearers, Advisors, Consultants and Circle Secretaries meeting at New Delhi on 28th and 29th June 2018 wherein the so called majority Association is detrimental to the interests of executives. They are mis-leading the executives that the CPCs may take two years or more time in completing the process whereas Comrade GS has discussed in detail with Director (HR) regarding conduction of CPCs and she has categorically mentioned that in the recent meeting of all the cadre controlling officers, a road map has been decided to expedite all the CPCs in a time bound manner for all disciplines i.e. Telecom / Finance / Civil / Electrical / Architect / Telecom Factory wings before 15the July 2018. And, she has categorically told that before 30th June 2018 only 20% CPCs conduction is possible. And, after notification of CPSU Cadre Hierarchy the CPC process has to be stopped. In view of this situation, AIBSNLEA has decided to hold demonstrations on 27th June 2018 during Lunch Hours at all SSA/Circle HQs and BSNL Corporate Office level. The necessary notices for the aforesaid meeting and holding of demonstrations on 27th June will be issued shortly. All the Central Office Bearers, Advisors, Consultants and Circle Secretaries are requested to immediately book their both way journey tickets to New Delhi immediately. BSNL Corporate Office EW Wing has issued promotion orders to the grade of EE (Civil)/AGM or equivalent on regular basis notionally with effect from the date motioned against their name and actually from the date of assuming charge by them. GS discussed with CMD BSNL, Director (HR) and GM (Pers) regarding holding of CPCs to fill-up all the vacant Group "B" and Group "A" level posts through CPCs in various disciplines. CMD BSNL and Director (HR) assured to look into the matter and GM (Pers.) told that on Monday a meeting will be held with AIBSNLEA to discuss the matter. Today, the matter related to the seniority issue for JAO to AO promotions was came up for hearing in the Hon'ble CAT Bench Bangalore. Hon'ble CAT after some hearings ordered that "without prejudice to any of the contentions of both the parties, this interim order is vacated at the request of both the parties. Post on 25.07.2018." Thus vacation of the stay order has paved the way for conduction of the CPC from JAO to AO. We are thankful to the applicants who agreed to withdraw the case on our request. CMD BSNL has already approved the CPC proposal from JAO to AO to fill-up about 2400 AO vacant posts by considering up to JAO-2013 Batch. The CPC proceedings are to be initiated and expedited shortly. GS discussed with OSD to Director (HR) regarding holding of CPCs to fill-up all the vacant Group "B" and Group "A" level posts through CPCs in various disciplines before implementation of CPSU Cadre Hierarchy. OSD to Director (HR) informed that today Director (HR) called all the cadre controlling authorities i.e. GM (Pers. ), GM (FP), CGM (EW), CGM (BW) and CGM (Arch) and discussed the progress with respect to the CPCs of their wings. After detailed discussions competent authority directed all the cadre controlling authorities to submit a road map to expedite the CPCs in a time bound manner before notification of CPSU Cadre Hierarchy. Director (HR) also directed them to expedite the CPCs as per the existing seniority lists of SDE/AO equivalent cadres to the post of DE/CAO/EE equivalent cadres on adhoc basis subject to out come of the court cases. Comrade GS extended thanks for a right and justified decision. (a) Representation from Shri Roopesh Cholwal, SDE, HR No. 200701662 regarding exercising of option for transfer on promotion from JTO (T) to SDE (T). (c) Representation received from Shri V.G. Rekhawar, HR No. 198312333 in the matter of preparations for e-DPC – Requirement of AGM's (Regular) working as on date & screening committee report. (d) Representation received from Shri R.C. Gupta, SDE (T) HR No. 198806337 regarding allotment to Rajasthan Telecom Circle on his promotion to DE (T) cadre. (e) Representation received from Shri P.K. Tailor, SDE OFC (M), NTR, HR No. 198401768 regarding allotment to Rajasthan Telecom Circle on his promotion from SDE to DE (Telecom). (f) Representation received from Shri M. Vasu, Sr. SDE, HR No. 199309706 regarding his posting in Telangana Circle on promotion to the grade of AGM. (g) Representation received from Shri Sundar Pal Staff No. 37633 AGM Marketing % PGMTD Karnal regarding his missing name in the list of all working DE/AGM regular for e-DPC for DGM promotion. (a) Requests for transfer / posting / cancellation / retention in the Cadre of Accounts Officers. (b) Representation received from Shri K. Pedda Rao, AO, Staff No. 181131, Andhra Pradesh Circle regarding his missing name in seniority list of AO/Sr. AOs. (c) Representation received from Smt. Mumta Raina, AO, J & K Circle regarding corrections in provisional seniority list in the grade of Senior Account officers / Account officer. Group A: 5th of the following month and if 5th is holiday then the next working day. Group B:1st of the following month and if 1st is holiday then the next working day. BSNL Corporate Office reloads the letter dated 15.06.2018 wherein it was requested to forward screening committee reports and APARs of all AGMs working on regular basis with revised Annexure. All the Circle Secretaries are requested to kindly arrange to send the representation received, if any, in this regard to AIBSNLEA CHQ immediately for taking it up with DPC Cell for the corrections, if required. BSNL Corporate Office issued instructions to all concerned TF Circles to constitute Screening Committee for preparation of the Assessment Sheet and furnish the Committee Report in the prescribed proforma along with ACRs/ APAR of all SDE(TF) for the period 2011-12 to 2015-16 positively by 23.06.2018. Concerned Circle Secretaries are requested to kindly arrange to sent the requisite information to BSNL Corporate Office as required. GS discussed with Jt. GM (Pers.) regarding the decision taken by the competent authority to fill-up all vacant Group "B" and Group "A" STS level posts through CPCs before implementation of CPSU Cadre Hierarchy. Jt, GM (Pers.) informed that tomorrow Director (HR) is holding a meeting to discuss and decide the action plan to fill-up the vacant Group "B" and Group "A" STS level posts. AIBSNLEA has already requested CMD BSNL, Director (HR) and GM (Pers) to consider our above requests. It is reliably learnt that the CMD BSNL has approved the CPC proposal from JAO to AO to fill-up about 2400 AO vacant posts by considering up to JAO-2013 Batch. 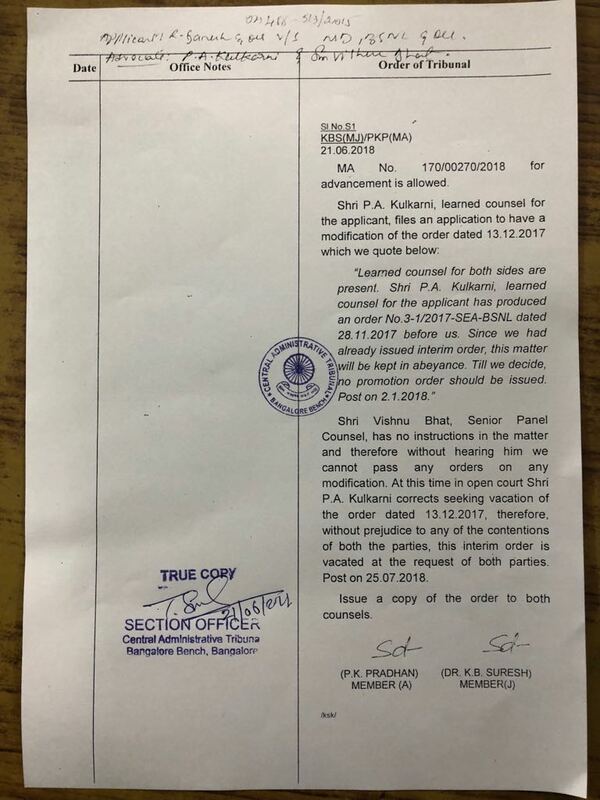 The promotion orders for JAO to AO will be issued subjected to withdrawal of the court case in the Hon'ble CAT Bench Bangalore. AIBSNLEA continuously pursuing the CPC process. 20.06.2018: GS requested Director (HR) and GM(Pers.) regarding to direct Pers. and SEA cell to consider SDE/AO to DE/CAO promotion orders also before CPSU Cadre Hierarchy notification otherwise they all will be stagnating in Sr. SDE and Sr.AO Cadres in a functional cadre now created. GS also requested to fill up all vacant SDEs/AOs equivalent post before CPSU Cadre Hierarchy notification. GM(Pers.) assured to discuss the matter with Director(HR) today and will also direct the concerned for conducting above cited CPCs. 20.06.2018: JAO to AO CPC: GS discussed with CS Karnataka regarding withdrawal of court case at Bangalore filed by Sh. Ganeshan JAO with seven others who has taken stay order on promotion till JAO Seniority list is finalized as per DoP&T instructions since JAO recruitment in 2013 will be covered in this JAO to AO CPC. Com. CS KTK & CP KTK discussed Sh. Ganeshan & others for withdrawal of case. The applicants have agreed to withdraw the case & today they will file an application in Hon'ble Court for withdrawal of case. This will pave the way for conduction of this CPC from JAO to AO. We are thankful to the applicants agreed to our request. BSNL Corporate Office has called VC of 4226 executives of SDE (T) cadre for considering them for promotion to the grade of AGM/DE (T) from the office of CVO vide letter dated 08.06.2018. BSNL Corporate Office now circulates the list for getting any errors / omission / addition / deletion / correction of this data. BSNL Corporate Office further intimated that the process for e-DPC from List No. 8 will be considered in due course. "BSNL will launch 5G services the same day as their launch globally," BSNL Chief General Manager Anil Jain said. BSNL Corporate Office once again requested to arrange to forward the APARs of all Telecom Finance Executives up to the period ending 31,03,2017 immediately. It has been reported that APARs of 638 Executives up to 16-17 is still awaited desipte issuance of the reminders on 26.11.2016, 16.06.2017, 01.09.2017, 27.10.2017, 27.12.2017, 08.02.2018 and 06.06.2018. BSNL Corporate Office has requested to review and keep ready the APARs of eligible executives and update it till 2016-17. All the Circle Secretaries are requested to kindly arrange to update the desired APAR folders at the earliest. 18.06.2018: Filling up of the vacant post of Group-'B' & Group-'A' STS equivalent posts through CPCs of all disciplines: GS discussed OSD to Director(HR) & Jt. GM(Pers.) and requested to expedite CPCs to fill up of the vacant post of Group-'B' & Group-'A' STS equivalent posts through CPCs of all disciplines. OSD to Director (HR) in the presence of Director (HR) assured an early action in this regard & Jt. GM (Pers.) clarified that in account wing JAO to AO CPCs by upgrading some JAO posts to AO posts proposal is under consideration. AO to CAO promotion proposal from SEA Cell is available in Pers. Cell and after taking legal opinion one MA is being filed Hon'ble CAT Chandigarh on the basis of recent Hon'ble SC judgment & DoPT guidelines issued on SC/ST roster implementation after informing to Hon'ble CAT Chandigarh immediately AO to CAO CPCs will be expedited. We requested to utilize MT quota CAO posts for promotion to AO. Jt. GM (Pers.) assured that these MT Quota posts of CAOs will be utilized on adhoc basis. He assured an early action in this regard. In Electrical wing, JTO(E) to SDE(E) & SDE(E0 to EE(E) CPCs proposal has been cleared by Pers. Cell and now EW Cell, BSNL Corporate Office, New Delhi called VCRs for promotion. In Civil wing already clearance has been given by Pers. Cell to BW Cell on JTO(C) to EE(C) in Pers. Cell is under consideration. TF Wing: Jt. GM (Pers.) informed that JTO (TF) to SDE (TF) and SDE (TF) to AGM (TF) proposal for CPC will be send to Director (HR) for approval shortly. PA to PS Promotion: We requested Jt. GM(Pers.) to give approval to the proposal of Circles on PA to PS CPCs. Jt. GM(Pers.) informed that all the proposal received from Circles have been cleared, some specific pending cases, if any, may be informed for an early action. He assured an early action to expedite all above mentioned CPCs at the earliest. All the above CPCs to fill up Group-'B' & Group-'A' STS equivalent posts through CPCs of all disciplines are being conducted as requested by AIBSNLEA before notification of CPSU Cadre Hierarchy. 18.06.2018: Joining of newly promoted SDEs in ERP: It is reported to CHQ that some Circles joining through ERP to newly promoted SDEs finding problems. Com. GS discussed the matter with the concerned Officer in Pers. Cell, BSNL Corporate Office, New Delhi and they explained that so far staff no. of newly promoted LDCE quota and SCF Quota have not been finalized. They suggested that these newly promoted SDEs should submit HRMS no. instead of staff no. in their joining in ERP so that their joining will be accepted. 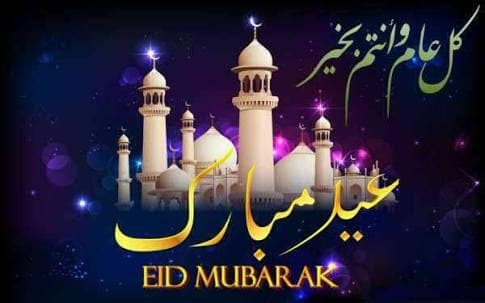 AIBSNLEA is thankful to CMD, BSNL, Director (HR) BSNL Board, GM (Pes. ), GM(SR), GM(CLO), Jt. GM (Pers), OSD to Director (HR), BSNL Board and all concerned Pers. Cell Staff for issuing the above promotion orders..
GS discussed with GM(Pers.) regarding issuing of promotion orders from JTO(T) to SDE(T) SCF Quota. GM(Pers.) mentioned that the DPC work is being expedited today itself and efforts are being made to take the approval of Director (HR) so that promotion orders are issued today. We are expecting that JTO(T) to SDE(T) SCF quota orders will be issued today itself. As soon as the promotion orders are issued, the same will be updated on CHQ side. BSNL Corporate Office calls list of AGMs (Regular) working as on date & Screening Committee reports for preparation of e-DPC. AIBSNLEA's consistent efforts yielded results as the JTO to SDE (T) promotions orders under SCF quota numbering around 3,200 wherein JTOs recruited in the year 1999 may be covered are expected to be issued by tomorrow after getting the approval from the competent authority. AIBSNLEA tried to get filled up all vacant 10,000 posts of SDE (T) but the Management took a decision to fill-up only 3,200 posts with respect to the LDCE conducted for the year 2009-10 and 2010-11 and rest of the vacancies they considered as under dispute and therefore left it. We will continue our efforts to get filled-up all these vacant posts. AIBSNLEA's consistent efforts yielded results in getting initiated the preparatory exercise for promotion to SDE (TF) cadre. BSNL Corporate Office has called for the screening committee report along with ACRs of all JTOs for the period 2007-08 to 2015-16 as per DOP&T circular number F.2201/5/86-Estt.D New Delhi dated 10.03.1989 and VC status of the eligible JTOs as per SDE (TF) RR. Concerned Circle Secretaries are requested to kindly arrange to sent the requisite information to BSNL Corporate Office at the earliest. BSNL Corporate Office today published the post based roster in respect of AGM/DE (TF) regular as on 01.04.2018. GS writes to Shri Anupam Shrivastava, CMD, BSNL regarding our submissions for utilization of 50% MT Quota Posts in Accounts Wing to the Seniority Quota Posts of CAOs for giving promotions on adhoc basis in view of acute stagnation in the Cadre of Accounts Officers. BSNL Corporate Office releases clarifications on the queries raised by some of the filed units for updation of data in ERP for smooth processing of e-VC/CPCs. All the Circle Secretaries are requested to kindly bestow their personal efforts for submission of the desired information to the BSNL Corporate Office at the earliest. 1 Smt. Sujata Ray, Director (HR), BSNL Board regarding our submissions for implementation of Hon'ble Supreme Court judgment dated 14.12.2017 in the matter of fixation of seniority of TES Group "B" officers in BSNL on the basis of Rule 206. BSNL Corporate Office issues instructions for preparation of APAR evaluation sheets of the JTO (E) for regular promotion to the grade of SDE (E) for vacancy year 2016-17 and 2017-18. GS and President met GM (Pers) and discussed regarding CPCs from JTO/JAO to SDE /AO, SDE/AO to DE/CAO, DE to DGM of equivalent cadres in all disciplines. We requested to expedite CPCs from JTO/JAO to SDE /AO, SDE/AO to DE/CAO, DE to DGM of equivalent cadres in all disciplines. GM (Pers.) mentioned that SDE to DE CPC (4300 posts) is in process and DE to DGM CPC (900 posts) has also been initiated in view of the recent Hon'ble Supreme Court judgment on implementation of SC/ST roster. He further mentioned that JTO to SDE (T) (3500 post under SCF quota for the year 2009-10 and 2010-11) promotion issue is under discussion and shortly a decision will be taken in view of the Hon'ble High Court Kerala judgment. The same principle will be adapted for AO to CAO (1327 posts) promotion as being done in DE to DGM promotions. Similarly, JAO to AO (2450 posts) CPC will also be expedited. GS, President, AGS (F) met Director (HR) and discussed regarding CPCs to fill-up the vacant Group "B" and Group" A" level posts before implementation of CPSU Cadre Hierarchy: We requested Director (HR) to expedite CPCs to fill-up the vacant Group "B" and Group "A" level posts before implementation of CPSU Cadre Hierarchy. Director (HR) mentioned that GM (Pers) has been directed to expedite the CPCs in all disciplines to fill-up the vacant Group "B" and Group"A" level posts. She assured an early action in this regard. CMD BSNL called a meeting of the core committee members of all Unions and Associations wherein Comrade GS along with core committee members i.e. GS.BSNLEU, GS/NFTE and GS/SNEA attended the meeting. CMD BSNL mentioned that joint efforts of BSNL Management and all employees are required to increase the revenue of BSNL. CFA segment: He mentioned that Broad-band connections surrender is taking place due to speed limit constraints and FTTH growth is also not much. He further mentioned that we should explain the customers that Broad-band copper market is not for speed, it is for download wherein maximum 2Mbps to 20Mbps. The tariff under Rs. 99 Plan 70 GB down load is available for speed purpose Mbps Plan through FTTH should be recommended wherein the Exchange to Subscriber premises wireless network is being created on revenue sharing basis through channel partners immediately. CAPEX will be arranged to have our own wireless system. Cable TV operators (Local TV) are also facing threat from JIO and now we will make them cannel partner on 50:50 revenue sharing basis. In this manner the Brad band target has now been increased to 20 times. CM Segment: CMD mentioned that in CM segment 40% revenue has gone down which has affected cash flow. The main reason is that BSNL don't have 4G spectrum and metro cities lie Delhi & Mumbai. Now BSNL decided to deal directly with retailers along-with franchises. The commission will be paid 12% whereas Reliance JIO is giving 9% and Airtel 5%. Proper monitoring system on retailers is very much required. Recently BSNL has signed an MoU with Patanjali Group and now offering a special plan of Rs. 144 with unlimited voice, 1.5GB data per day to all Patanjali card holders. Through this we should capture the market. EB Segment: CMD informed that last year our revenue growth was positive in this segment by providing maximum lease line circuits after 7-8 months JIO is also entering in this field. To compete with now BSNL officers have to leave their rooms and go for marketing. And this moment is known "KAMRA CHODO - Leave the Rooms". In this manner, CMD clarified that BSNL has to increase its revenue without depending on Govt support. At this stage, we can not ask Govt support in view of the implementation of 3rd PRC. We assured to discuss the matter and mobilize the employees in this regard. Incentive to BSNL employees and BSNL pensioners: CMD informed that we are finalizing an incentive scheme under Marketing Cell to the BSNL employees and BSNL pensioners for selling the BSNL brands and to become channel partners. AIBSNLEA's consistent efforts yielded results in getting released a clarification from BSNL Corporate Office that the Group "B" abosrbess working as DGM on adhoc basis (availing E5 pay scale) shall be eligible for consideration of time bound pay up-gradation to E6 scale under the EPP if otherwise eligible on the same consideration as being done for other executives. 08.06.2018: Up-dation of data in ERP for preparatory work for promotion to different grades / streams. Now the responsibility to enter data has been entrusted on each individual executive / officer to enter correct data for which a POP UP has been provisioned in the ESS Module of ERP Portal for up-dation of data by individual employee himself. All the CHQ Office Bearers, Circle/District Secretaries are requested to kindly educate all employees to fill-up the correct data in the ESS Module so that the CPC works can be completed in a shortest time frame. GS, President, AGS (F), OS (West) and CS (MH) met GM (Finance), BSNL Corporate Office, New Delhi discussed regarding the CPCs to fill-up the vacant posts of AOs and CAOs before notification of the Cadre Hierarchy to avoid litigation. GM (FP) mentioned that the CPC from JAO to AO promotions has been initiated for about 2000 AO posts wherein the JAOs recruited in 2013 will be covered. CHQ is pursuing with the applicants in CAT Bench Bangalore to withdraw the case. Similarly, the CPC for the promotions from AO to CAO has to be initiated after taking legal opinion from the Pers. Cell and CGM (Legal), BSNL Corporate Office in view of the directions given by the Hon'ble CAT Chandigarh on considering the catch up rule on promotions. She mentioned that about 1327 CAO posts will be filled up by conducting the CPC. The APARs/VCRs of the eligible JAOs/AOs have been called for from the circles. The APARs of 2015-16 and 2016-17 will be downloaded from ERP but it has to be complete in all respect. GM (FP) requested all concerned including AIBSNLEA in completing APARs at the earliest so that the CPCs can be conducted before notification of CPSU Cadre Hierarchy in BSNL. Circle Secretaries are requested to get completed the screening committee report in respect of promotions from JAO to AO. A CPC from JTO (T) to SDE (T) SCF quota: We requested Director (HR) for issuing promotion orders from JTO (T) to SDE (T) under SCF quota in accordance with Hon'ble High Court Kerala judgment delivered on 05.06.2018. Director (HR) directed Pers. Cell to expedite CPC immediately. Also marked our letter dated 08.06.2018 to GM (Pers) for consideration. B Finalizing the CPCs calendar to fill-up the vacant Group "B" and STS level vacant posts: We requested to give necessary directions to all the cadre controlling GMs/PGMs/CGMs for initiating the CPCs to fill-up the vacant Group "B" and STS level vacant posts. Director (HR) directed her OSD to issue necessary instructions to all cadre controlling authorities to prepare and submit the CPCs calendar immediately. C Affairs of Maharashtra Circle wherein the executives are being transfer on look after arrangements: We requested Director (HR) for her kind intervention and issuing the necessary instructions to the Maharashtra Circle for not transferring executives on look after arrangements as per the existing policy. Director (HR) assured to look into the matter. In an attempt to get stay order on implementation of the BSNL Corporate Office letter dated 06.06.2018 an application was filed in the Hon'ble PBCAT New Delhi under OA No. 357/2018 Rupendra Pathak Vs M/o Communications. The case was listed at Item No. 23 today in the Court No. 2. Senior Advocate appeared on behalf of the petitioner pleaded for grant of stay order on implementation of the revision of seniority order issued by BSNL on dated 06.06.2018. AIBSNLEA advocate intimated the Hon'ble court that the petitioner is enjoying wrongly assigned seniority which has been corrected after Hon'ble Supreme Court judgment dated 12.12.2017. 08.06.2018: Meeting with Member (Finance) held on 07.06.2018 (Left out issue): We also expressed concerned against the recent procedure being adopted for the payment of pension from CCA instead of banks to BSNL pensioners. Member (Finance) clarified that BSNL pensioners will continue to draw their pension from banks only as per the exiting arrangement. Some internal procedure is being modified wherein CCA will directly give the information to the banks regarding pensionary benefits. This way the procedural delay will be minimised. 1 The CMD, BSNL regarding our submissions for promotion from JTO (T) to SDE (T) under SCF quota consequent upon judgment of Hon'ble High Court of Kerala. 5 Recruitment of ED in BSNL through immediate absorption basis. All the Circle Secretaries are requested to kindly bestow their personal attention and arrange to furnish the requisite information immediately to BSNL Corporate Office. GS, President, OS (West) and GS AIRBSNLEWA met Member (S), Telecom Commission and discussed regarding pension revision of BSNL pensioners. Member (S) advised us to provide a brief note to DDG (Estt), DoT on the anomaly which may take place amongst the pensioners on revision of pension of the pensioners prior to 01.01.2017 and the pensioners who retired or retiring after 01.01.2017 with or without implementation of 3rd PRC. A Implementation of 3rd PRC report with 15% fitment benefits in BSNL: We requested Member (F) for giving her clearance to the BSNL Board approval on 3rd PRC implementation in BSNL and as per the reply received from DPE. Member (F) mentioned that she has not received any proposal in her office in this regard. We informed her that the file is pending with DDG (EF), DoT. She immediately spoke with DDG (EF) and inquired about the status of file. DDG (EF) informed that he has returned the file to the Director (PSU) for clarifying some queries. Member (F) directed him to submit the file to her after receiving the reply from the concerned section. Member (F) further mentioned that she is in favour of implementation of 3rd PRC in BSNL. B Revision of Pension: We requested for revising the pension of BSNL pensioners by de-linking from the pay revision of the serving employees. Member (F) mentioned that this matter is being dealt by Member (S) and on recept of the case she will consider favourably. C Payment of pension contribution on actual basis instead of maximum of pay scale: We requested Member (F) to consider the payment of pension contribution on actual basis instead of maximum of pay scale. Member (F) mentioned that on receipt of the case from Estt. Cell of DoT she will give her clearance on the proposal which is to be sent to DoE. GS met Director (HR), BSNL Board and requested to fill-up the vacant SDE (T) posts of SCF quota immediately in view of the judgment delivered by Hon'ble High Court Kerala on 05.06.2018. Director (HR) assured an early action in this regard. GS met CMD BSNL and requested to promote the JTO (T) to SDE (T) of SCF quota in accordance with the judgment delivered by Hon'ble High Court Kerala on 05.06.2018. CMD assured to look into the matter. AIBSNLEA and AIRBSNLEWA's combined efforts yielded results in opening of a grievance redressal cell for retired employee of BSNL under the SR Cell of BSNL Corporate Office. Now the grievances may be filed by the retired employees online through the link https://goo.gl/forms/PI5OasDWWYsulgus2. On clicking the link, a form will be opened. Details are to be filled in Section-2 (Personal Details) and Section-3 (Grievance Details). Most of the questions are to be answered with multiple choice and check boxes/drop-down options. Some of the questions are mandatory. Forms can be filled through mobile or laptop/PC. The grievances shall be referred to the concerned cell of Corporate Office and Circles by GM (SR), the nodal officer. All concerned should take prompt action on receiving the mails from the Grievance Redressal Cell i.e. SR Cell of Corporate Office. The closure of the complaints/grievance shall be monitored by SR Cell. We are thankful to CMD, BSNL, Director (HR) and GM (SR) for facilitating the pensioners for the redressal of their grievances. Certified copy of the judgment has been received by AIBSNLEA through its advocate. 1. Hon'ble High Court Kerala is of the view that the pragmatic way of fixing seniority of the departmental JTOs and Direct Recruit JTOs would be reckon date of appointment as regards to the Direct Recruits and the date of promotion as regard to the promotes, once they successfully complete the training and then interpose them in the seniority list in accordance with the rotation of quotas, reckoning their due seniority or position in their respective list of appointment or order of promotion. In such circumstances the direct recruits are entitled to be considered for inclusion in the seniority list only after their actual entry in service and they could not make any claim to the un-filled quota of direct recruits during the period 1996 to 2001. 2 the final seniority list by BSNL has to be finalized with in a period of six months from the date of receipts of the copy of this judgment on the above mentioned principal. 3 It will be open for BSNL to effect promotion against the unfilled vacancies of SDE equalling distributing the vacancy amongst the senior most directly recruited JTOs and senior most promote JTO subject to finalization of the final eligibility list of JTOs. In view of the above, AIBSNLEA feels that BSNL Management can immediately expedite CPC from JTO to SDE (T) SCF quota from the departmental JTOs of the vacancy year 1996 to 2001 and thereafter from a consolidated list of equally distributing departmental JTOs and direct recruit JTOs in 1:1 ratio. Accordingly about 4500 departmental JTO will immediately be promoted along with direct recruited JTOs of the year 2002 Batch and SC/ST upto 2005 Batch. Thus BSNL Management should initiate and expedite CPC. Before implementation of the CPSU Cadre Hierarchy, if above promotions orders are issued there will be no dispute of seniority which will avoid further litigations. A In the matter of promotions in the grade of JAG of Telecom Finance on regular basis. APAR of 9 executives is still awaited. B APAR of 129 executives upto 15-16 is not received so far. BSNL CO requests to send APARs of all the Telecom Finance Executives up to the period ending 31.03.2017 immediately. All the Circle Secretaries are requested to kindly look into the matter and ensure timely submission of the requisite APARs to BSNL CO.
06.06.2018: Meeting on implementation of Rule 206 on the seniority of TES Group "B"
GS, President, AGS (HQ), OS (West) and CS (MH) met with OSD to Director (HR), Jt. DGM (Pers) and DGM (Pers-II) and discussed regarding implementation of Rule-206 on the seniority of TES Group "B" consequent to the judgment of Hon'ble Supreme Court on 14.12.2017. OSD to Director (HR) apprised about the status of the implementation plan for the judgment. After detailed discussions, we categorically requested that the Hon'ble Supreme Court Judgment should be implemented in true spirit without any deviation. OSD to Director (HR) assured for its true implementation. GS, President, OS (West) and CS Maharastra Circle met CGM (EW) and requested to fill up the vacant post of SDE (E), EE (E) & SE (E) in view of the actions are being taken by Pers. Cell to fill up the vacant SDE (Telecom.) & DE posts. CGM (EW) mentioned that the proposals to initiate the CPCs to fill up the vacant SDE (E), EE (E) & SE (E) posts have been sent to Pers. Cell for clearance. He mentioned that the proposals are sent to fill up 100 SDE (E) posts, 134 EE (E) posts and 38 SE (E) posts. He assured that as soon as the clearance is received CPCs will be expedited within this month. 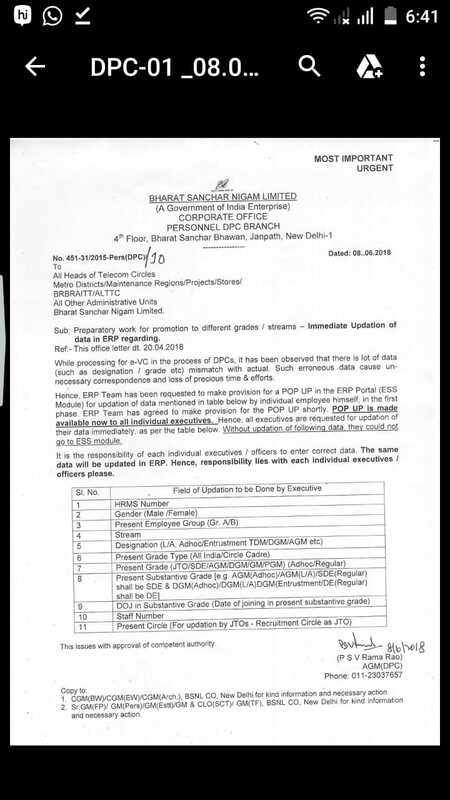 BSNL Corporate Office revises the seniority list 147 LDCE passed executives of TES Gr. "B" equivalent to SDE (T). The judgment in the above case along with other connected cases was pronounced by the Division Bench of the Hon'ble High Court comprising Hon'ble Mr.Justice. C.T Ravikumar & Hon'ble Mr.Justice. K.P.Jyothindranath on 05.06.2018 when AIBSNLEA counselor Advocate Benny M John appeared on behalf of AIBSNLEA, the 16th respondent. * The main findings of the Tribunal were not interfered by the Court. * The final eligibility list is to be prepared within 6 months and provisional promotions can be done on a 1:1 ratio equally from the senior most promotees and senior most direct recruitees. AIBSNLEA has applied for the certified copy of the judgement and the same will be shared on receipt. a) Implementation of 3rd PRC report with 15% fitment benefit in BSNL: In this regard Dir(PSU) informed that the BSNL Board approval along with the DPE reply letter on 3rd PRC report implementation in BSNL has been processed and now pending in the internal finance of DoT for clearance. After the clearance of DoT finance a Cabinet note will be prepared and with the approval of Hon'ble MOSC (I/C) it will be sent to the nodal ministries i.e. DPE, DOP&W, DoE and law ministry for circulation/comments. After the compilation of all the nodal Ministries comments the cabinet note will be sent to the Union Cabinet for the relaxation in the affordability clause of 3rd PRC for BSNL. 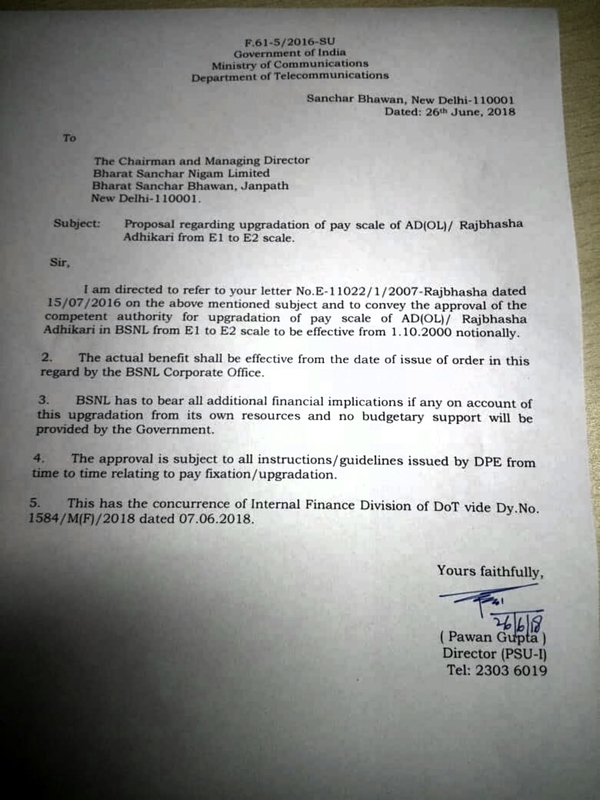 b) Restructuring of ADOL cadre: Dir (PSU) informed that the comments of DPE and DoE were received and now sent to internal finance of DoT for clearance. He assured that as soon as the finance clearance is received it will be immediately informed to BSNL. c) E2 & E3 standard pay scales to the JTO and SDE equivalent executives of BSNL: Dir(PSU) informed that the reply on DPE and DoE have been received wherein DPE has already clarified that it is the respective PSU and administrative Ministry who has to decide the standard pay scales for the particular cadres, no intermediate pay scales are authorized. DoE has also clarified that the respective Administrative Ministry may decide the pay scales for the particular cadre. DoE need not to play any role in this regard. Dir (PSU) further mentioned that DoT has already decided standard pay scales E1 & E2 for JTO and SDE equivalent executives. 05.06.2018: Meeting with Jt. (GM) Pers. : GS, President met Jt. GM (Pers) and discussed regarding CPCs to fill up the vacant SDE/AO and DE/ CAO equivalent vacant posts before implementation of CPSU hierarchy. Jt.GM(Pers) mentioned that JTO to SDE (Telecom) SCF quota CPC work has been initiated wherein all the APARs of 4500 JTOs are available and VCRs are being collected. After the confirmation of candidates who retired / resigned / expired from Circles are received immediately CPC will be expedited. He further mentioned that the court judgement in the Hon'ble High Court Kerala will be pronounced today evening thereafter the CPC work will be expedited. The target date is 15th June 2018. SDE to DE the CPC work has also been started where the APARs/ VCRs of the eligible SDEs are being collected. Simultaneously the 800 SDEs posts upgradations to DE cadre has been started. Thus, 3500 DE vacant posts Plus 800 DE upgraded posts will be filled up by CPC within this month itself. The target date is 30th June 2018. 05.06.2018: Meeting with GM(FP): GS, President met GM(FP) and discussed regarding filling up of the vacant 1000 AO and about 1300 CAO posts by conducting CPCs before the notification of CPSU cadre hierarchy. GM(FP) after detailed discussion on the status of pending court cases assured that she will discuss the matter with GM(Pers) and Dir (HR) to initiate the CPCs subject to outcome of the court cases. She assured an early action in this regard. 05.06.2018: Meeting with PGM(Admn.) BSNL CO: GS , President met PGM(Admn) and discussed regarding issuance of necessary order for the payment of medical bills on voucher basis. PGM(Admn.) mentioned that today itself this point will be discussed in the HR Group meeting with CMD BSSNL in the presence of Dir (HR) and thereafter the necessary orders will be issued. (a) Our request for expediting the CPC for promotion from JAO to AO before notification of the CPSU Cadre Hierarchy in BSNL. (d) Request creation of two Civil Division offices at Bhubaneswar and retention of Sr. Architect Office at Bhubaneswar, Odisha Circle. (a) Representations received for fixation of Pay in respect of JAO 10% quota departmental candidates-2010 Batch. (a) Representation from Shri Nirav R. Vyas, Architect, % Chief Architect BSNL Ahmedabad regarding his retention in Gujarat Circle. The case on JTO to SDE promotions was listed for hearing in Hon'ble High Court of Kerala today but could not be taken-up due to paucity of time. Now the case is listed for tomorrow at 16.15 Hrs. 04.06.2018: Misleading information by AIGETOA against AIBSNLEA posted on their website dated 30.05.2018. AIGETOA in their website as updated on 30.05.2018 the GS AIBSNLEA falsely indicated AIGETOA name about the Allahabad court case and un-necessarily bothered Director (HR) for the reasons best known to him. This update on AIGETOA CHQ website is false and un-called for a responsible Association without verifying the facts. The fact remains that AIBSNLEA CHQ Office Bearers had meeting with Director (HR) in the presence of GM (Pers.) and demanded to issue JTO to SDE (T) SCF quota promotions also since these JTOs are waiting for their first promotion since 1995 JTO Recruitment year. Director (HR) appreciated our concern and asked GM (Pers.) to explain the bottle neck in the promotion of JTO to SDE (T) SCF quota, if any. GM (Pers) explained that the court case in the Hon'ble High Court, Kerala has been listed for pronouncement of the judgment on 4th June 2018 and one more court case stay order is pending in the Hon'ble High Court Allahabad and in this regard yesterday GS AIGETOA has assured him to get withdraw the court case by tomorrow itself. After hearing this reply Director (HR) immediately spoke with CGMT Kerala Circle and directed him to take all the efforts through BSNL's advocate to get the judgment pronounced on 4th June itself wherein CGMT Kerala Circle assured her to get the judgment pronounced on 4th June 2018. Just after this, Director (HR) immediately called the GS AIGETOA in her chamber and advised him to ensure withdrawal of court case from Allahabad High Court by tomorrow itself and GS AIGETOA assured for its compliance by tomorrow. During these discussions, AIBSNLEA CHQ Office Bearers were present but they did not interact in between and never implicate the name of AIGETOA in it. Both the above actions of Director (HR) were based on the feedback given by the GM (Pers) only. Thus the allegation of GS AIGETOA against GS AIBSNLEA is false and uncalled for. AIBSNLEA is working and safe guarding the interests of entire BSNL executive's community in true sense which can be witnessed since its inception in the year 2004. AIBSNLEA need not to learn the functioning from the friendly Association. With the untiring efforts of AIBSNLEA only the BSNL Management decided to initiate CPCs to fill-up the vacant Group "B" and Group "A" level posts (up to DGM level) and after this decision, AIBSNLEA promptly persuaded to issue promotion orders wherever it is immediately possible. About 2000 LDCE qualified JTOs were waiting for their posting on promotions due to SC/ST Roster implementation court case and SDE RR modifications. BSNL Management responded positive to our demand and immediately issued modified SDE RRs. These two decisions paved the way to issue promotion orders of LDCE passed JTOs to the post of SDE (T) and accordingly, Management issued the promotion orders of 1987 SDEs of LDCE quota. To continue the process, AIBSNLEA emphasized BSNL Management to speed up CPCs work to fill-up all vacant SDE/AO and DE/CAO equivalent posts before notification of CPSU Cadre Hierarchy. Whereas, the fact remains that the so called joint forum is continuously pressurizing BSNL Management for immediate implementation of CPSU Cadre Hierarchy without holding of CPCs. The executives can analyse the truth with the ongoing developments for the last three years where more than 2000 LDCE qualified JTOs were waiting for their SDE promotion and the 4500 JTOs are waiting for the last 22 years for their first promotion to SDE cadre under SCF quota. WHAT THESE MIGHTY ASSOCIATIONS WERE DOING FOR THE LAST THREE YEARS? Now every body is trying to take the credit for the promotions, CPSU Cadre Hierarchy etc when these are becoming reality. CPSU Cadre Hierarchy was demanded by AIBSNLEA in the year 2011 where a committee headed by Shri S.R. Kapoor, the then PGM (FP) was constituted thereafter again another committee headed by the then PGM (SR) Shri N.K. Narang was constituted but both the committees failed to submit the report. Thereafter, a new committee headed by the then ED (NB) Shri M.A, Khan was constituted wherein AIBSNLEA, SNEA and AIGETOA were the members from Association side and after many marathon meetings the committee report was submitted which was twisted by Pers Cell BSNL Corporate Office in close coordination with the so called majority Association after referendum and with the support of their associate Association of Joint Forum. But, with the timely action taken by AIBSNLEA, many important modifications / improvements were incorporated in the CPSU Cadre Hierarchy. AIBSNLEA always demanded cut-off date from the last CPC or from the year of recruitment and some more issues but BSNL Board approved it with prospective date of implementation which AIBSNLEA protested and demanded immediate holding of CPCs to fill up the vacant SDE/AO, DE/CAO and equivalent posts before notification of CPSU Cadre Hierarchy to save the executives from humiliation because after CPSU cadre Hierarchy implementation all the existing RRs and posts of Group "B" and STS equivalent will be abolished and under new promotion policy. Under this CPSU Cadre Hierarchy these SDEs/ AOs equivalent executives are first to be promoted to the functional post of Sr. SDE/ Sr. AO equivalent and thereafter to the post of DE/CAO. It will further stagnate the existing SDEs and AOs who are waiting for their DE/CAO promotion. Whether the so called joint forum leaders are not aware of the facts that BSNL Management is intending to notify MT Recruitment simultaneously with the implementation of CPSU Cadre Hierarchy? If known, why they are hiding this fact from their members? Since they claim that they were involved in the process of finalization of CPSU Cadre Hierarchy and what is their stand now? AIBSNLEA has cleared its view to the BSNL Management on all the occasions whether it is during discussions or in writing to oppose MT Recruitment at STS level. Thus AIBSNLEA in true sense trying to protect the interest of entire executive community in BSNL rather than playing with the career prospects of executives in BSNL. Let the executives be understand the game plan of the so called Joint Forum Associations from the above facts. 01.06.2018: Pers. Cell of BSNL Corporate Office, New Delhi issued instructions to update the status of executives in ERP on or before 06.06.2018 since the process for Promotion to different grades of all executives / Streams is in active consideration. All the CHQ Office Bearers, Circle / Branch Secretaries are requested to go through the lists given above and ensure that the same may be got corrected by Admin. Cell in the ERP in targeted time i.e. 06.06.2018.